This item is correspondence of the Kansas Adjutant General's Office under Charles Chadwick (1862-1863) and Guilford Dudley (1863-1864), including special orders issued by Governor Thomas Carney to Samuel N. Wood of the Morris County Rangers to detain any organized bands of guerillas near Council Grove and William P. Dutton to equip his company in Miami County. Several letters were received from John B. 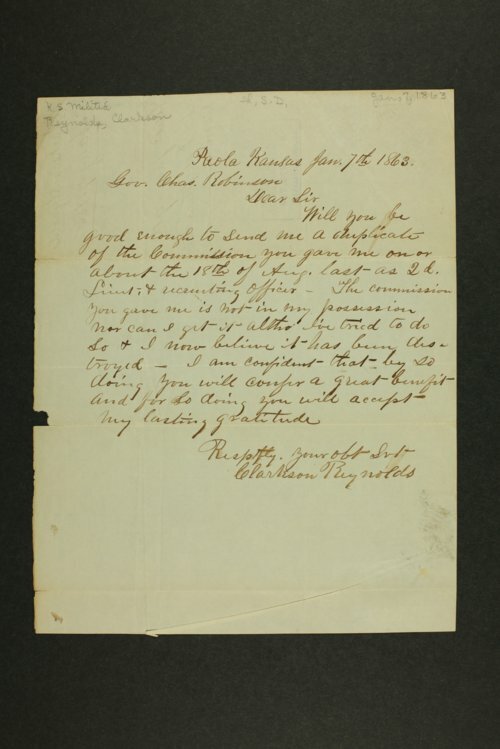 Gray, Missouri Adjutant General, inquiring about Missouri men that had enlisted in the Kansas militia. Most of the correspondence consists of requests for muster rolls, arms, resignations, and commissions. Other notable correspondents include Stephen A. Cobb and Sidney Clarke. A searchable, full-text version of this correspondence is available by clicking "Text Version" below.